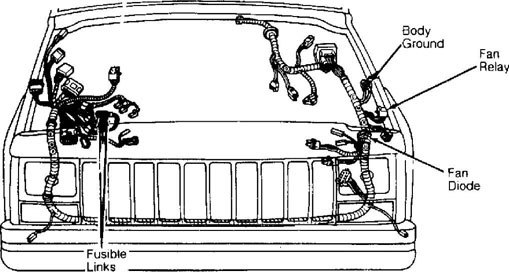 On Cherokee, Comanche and Wagoneer models with a 4.0L engine, A/C and/or heavy duty cooling system, an auxiliary electric fan is used. The auxiliary fan is controlled by a relay mounted on the left inner fender panel. 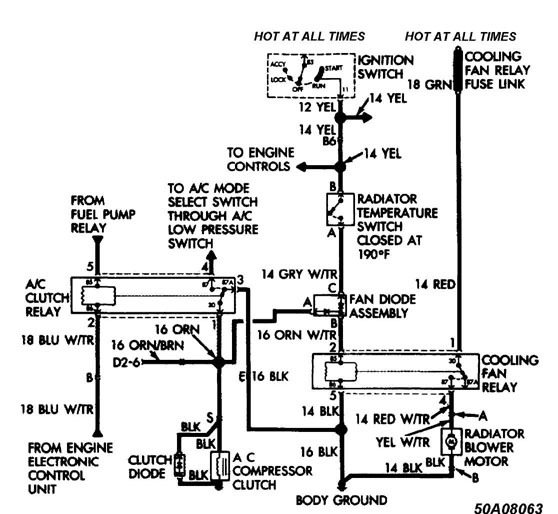 A radiator temperature switch attached to the radiator outlet tank above the lower radiator hose senses engine coolant temperature. When coolant temperature is more than 190 (0)F (88(0)C), the radiator coolant temperature switch closes allowing current from the ignition switch to flow through the fan relay to ground activating the relay. When relay is activated, battery voltage is supplied to the fan causing it to operate. 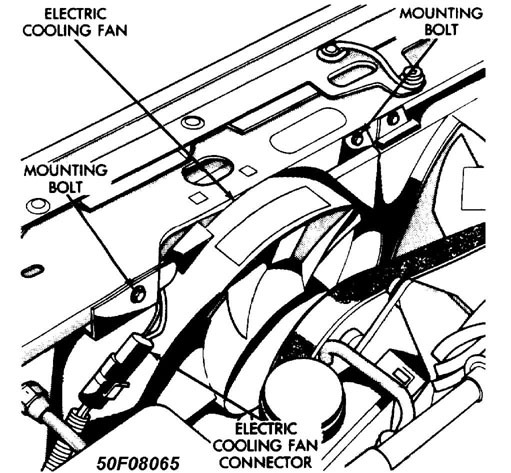 When coolant temperature is below 190 (0)F (88(0)C), the radiator coolant temperature switch opens preventing the relay from being grounded and electric cooling fan from being energized. Control Unit (ECU) grounds the A/C relay coil allowing current to flow through it. This activates the A/C relay which then supplies current to the A/C clutch, fan diode assembly and cooling fan relay. The cooling fan relay is activated and the fan operates. Whenever the A/C is used, regardless of engine coolant temperature, the auxiliary electric cooling fan operates. NOTE: For following tests, refer to fan relay connector terminal identification and fan controls identification. See Figs. 1 and 2 .
connector. 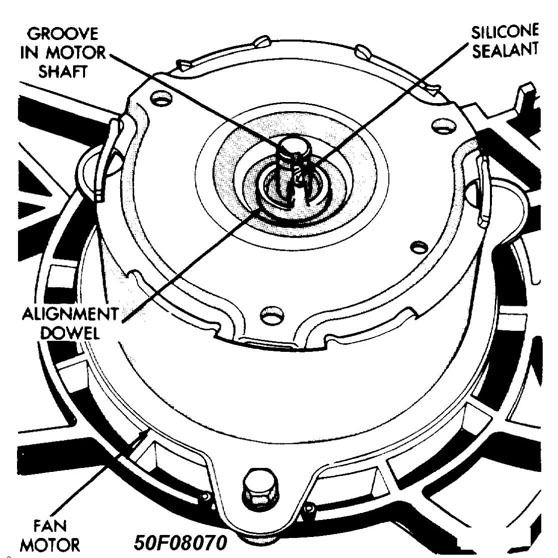 Fan relay is located on left inner fender panel. connector terminal No. 2. If voltmeter does not read battery voltage, replace fan diode assembly. fuse, supply battery voltage to fan relay connector terminal No. 4.
exist, repair open circuit. If continuity exists, go to next step. 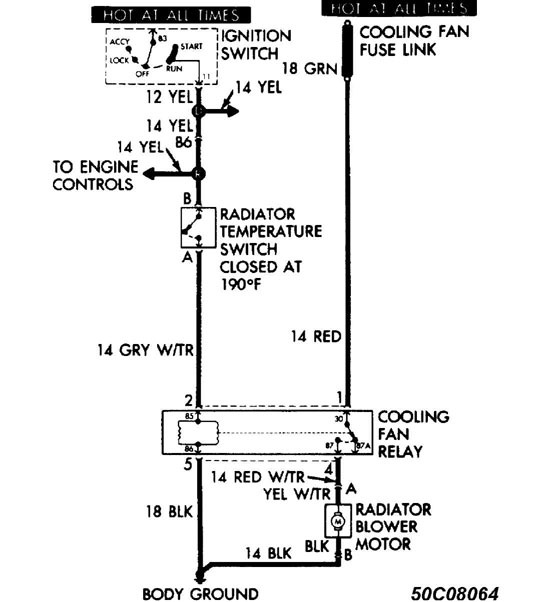 radiator temperature switch. If fan operates, go to next step. No. 2. If battery voltage is not present, replace fan diode assembly. battery voltage to fan relay connector terminal No. 4.
terminal No. 4 and body ground connections. If continuity exists, replace fan motor. If continuity does not exist, repair open and retest. does not exist, repair open. If continuity exists, go to next step. motor does not operate, repair fan relay fuse link. not operate, replace radiator coolant temperature switch. Fig. 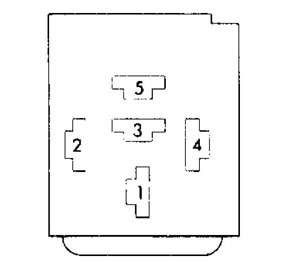 1: Fan Relay Connector Terminal Identification Courtesy of Chrysler Motors. Fig. 2: Fan Controls Identification Courtesy of Chrysler Motors. crossmember. Disconnect electric fan connector. Lift fan straight up out of vehicle. Components of auxiliary electric cooling fan can be replaced. However, components cannot be repaired. If an auxiliary cooling fan component needs repair it must be replaced with the recommended replacement part only. 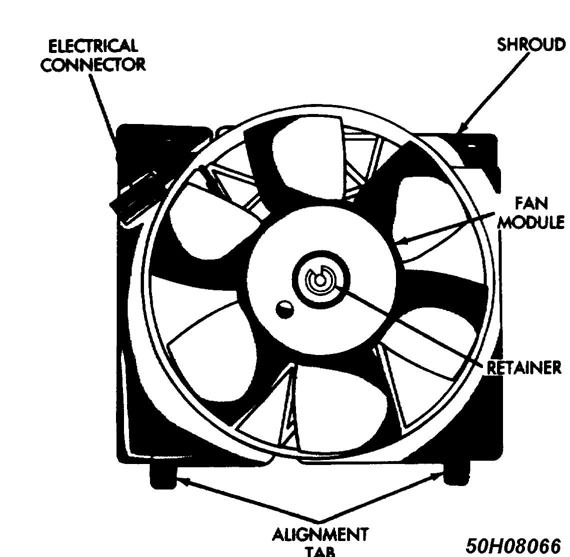 The auxiliary fan consists of a fan module, fan module retaining clip, fan shroud, and fan motor. 1) Place assembly on bench with fan blades facing up. 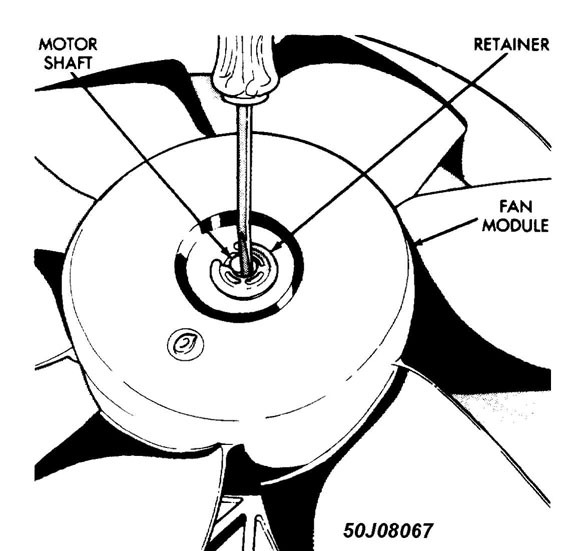 Position an awl between the fan retainer and motor shaft. Pry the retainer off the motor shaft. Slide fan up off of motor. Remove fan motor mounting screws. Remove fan. 1) Attach fan motor to fan shroud with mounting screws. Wind electrical connector into retaining clips of fan shroud. The bushing at fan module center has a small groove on the bottom side of it that fits over the alignment dowel on the fan motor shaft. The keyway pin of the alignment dowel fits into the groove in fan motor shaft. A small amount of silicone sealant placed in the groove of the fan motor shaft holds the alignment dowel in place. 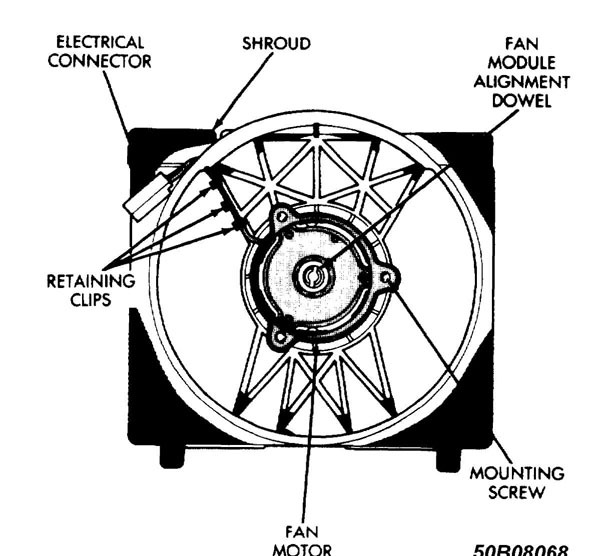 2) Place fan module over motor shaft, align groove in fan module with dowel on motor shaft. Start fan module retainer onto the fan motor shaft with open end of the retainer facing the groove in the shaft. When retainer is completely installed the open end will be on side opposite the groove. Use needle nose pliers to finish installing retainer. bracket at bottom of radiator and push fan down into position. Tighten mounting screws to 36 inch lbs. (4.07 N.m) . Connect auxiliary cooling fan electrical connector.